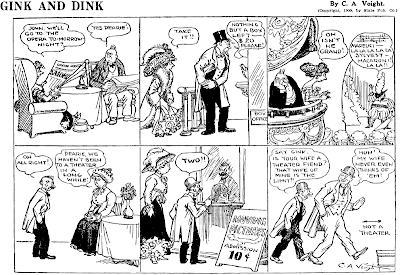 Gink and Dink may be an obscurity, but it’s certainly a far-roaming one. It was originally created by Charles A. Voight for the Boston Traveler when that paper got the urge to become a syndicate. Gink and Dink was one of the earlier features peddled by the Traveler‘s State Publishing Company. 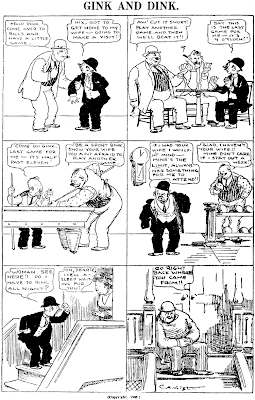 It debuted in the home paper on October 24 1908 and continued there until May 31 1910, presumably when it (finally) became obvious to Mr. Voight that the paper’s syndication attempt was a monumental flop despite offering some pretty neat features. Voight then left for New York where he placed Gink and Dink at the New York Evening Globe. It began there on December 14 1910 but only lasted until December 31st. I guess Voight didn’t like working for the Globe. A few months later it popped up at the New York Evening Mail. It started there on April 3 1911 and was soon also seen in other papers, presumably syndicated by Associated Newspapers. It ran in tandem with several other Voight efforts for a very respectable run through February 5 1914. Interestingly enough, the Boston Traveler, where it had originated, ran the feature in syndication. Although this feature did end in 1914, some might say it was just put up on blocks for a major retooling. Just a few months later Voight returned with a feature called Petey Dink, featuring a little fellow reminiscent of the Dink character in the original series. This strip, though, had Petey acting as straight-man to an unending parade of gorgeous gals. 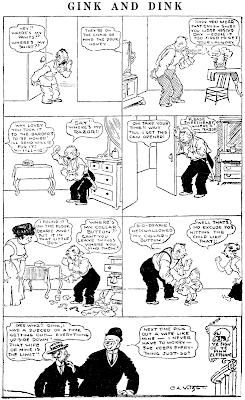 Although still married, Petey’s wife who had played such a major part in the original series was rarely seen in this version. Most published histories, however, blur the two features into one. A tip of the hat to Cole Johnson for the samples. Thanks Cole!